ALERT: While the City of Beaverton works to connect waterlines underneath the Westside Trail, the trail access from the west at SW Scholls Ferry Rd will be closed from January 31 to February 8, 2019. A recently developed Westside Trail segment on Mt. Williams has yielded a six-mile segment of mostly continuous trail from Tigard city limits to the Tualatin Hills Nature Park. ALERT: While the City of Beaverton works to connect waterlines underneath the Westside Trail, the trail access from the west at SW Scholls Ferry Rd will be closed from January 31 to February 8, 2019. During this closure, trail users will be rerouted to the stoplight crossing at the corner of SW Scholls Ferry Rd and SW 147th Place by way of a temporary gravel path. Trail detour signs will be posted in the area to help direct trail users. The 1992 Metropolitan Greenspaces Master Plan identified an opportunity to create a regional trail on Portland's west side -- initially called the Beaverton Powerline Trail -- along Washington County's electrical power utility corridors. Today, this route is the Westside Trail. Extending north to south through Tualatin Hills Park & Recreation District, the Westside Trail is one of the region's most important corridors. It connects west side neighborhoods and communities while providing access to the region's distinctive rivers, forests and prairies. Metro has developed a master plan to expand the Westside Trail, eventually rendering a 25-mile-long trail extending from the Tualatin River (near King City) to the Willamette River (in Portland's Northwest Industrial neighborhood). Within THPRD boundaries, Westside Trail expansion has been a priority for planners. A bond measure approved by voters in 2008 earmarked more than $4 million for the completion of three new trail segments, including a paved 1.5-mile expansion over Beaverton's Mt. Williams that provides picturesque views of the city below. The completion of that project in November 2013 has rendered a six-mile segment of mostly continuous trail extending from Tigard city limits at Barrows Rd. all the way to the Tualatin Hills Nature Park and the Merlo Road MAX station in Beaverton. The trail intersects or provides nearby access to several THPRD parks, including Progress Lake, Barrows Park, Murrayhill Park, Westside Linear Park, Hart Meadows Park, Summercrest Park and Burntwood Park. 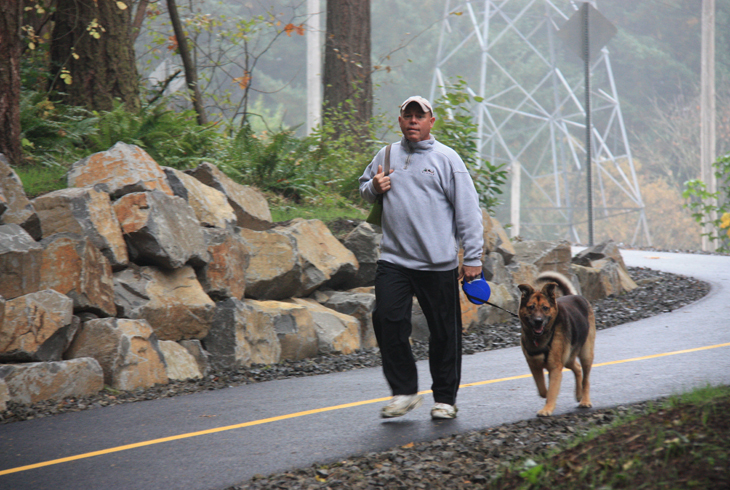 THPRD completed construction of the Westside to Waterhouse Trail Connection in the fall of 2016, which connects the Westside Trail to the nearby Waterhouse Trail along the north edge of the Tualatin Hills Nature Park. This short but vital section of the Westside Trail follows an abandoned rail bed to avoid impacts to the Nature Park and its sensitive natural areas and to provide a direct off-street commuter route to the Merlo Light Rail Station. THPRD began construction of a new segment of the Westside Trail north of US Highway 26 in the summer of 2016 – the Westside Trail segment 18 project. A portion of this trail segment was completed in March 2018 and is open to the public. Construction of the remaining portion of this segment is currently under way and is expected to be completed in the winter of 2018/19. When completed the trail segment will connect the Rock Creek Regional Trail at its north end to Kaiser Road at its south end, and will include a connection to Hansen Ridge Park as well as connections to adjacent neighborhoods and improved access to Kaiser Woods Natural Area. As funds become available, THPRD will continue to build new trail segments of the Westside Trail, ultimately yielding a 10-mile backbone that will extend north/south through THPRD's service area and over US Highway 26.